What exactly is the point of the multiple bean soups? You've seen these mixtures on the shelf - 7-bean soup, 9-bean soup, 13-bean soup - it is like a bizarre game of upmanship. I did the experiment of plugging in increasing numbers into a Google search, and only petered out after 21-bean mixtures (oddly enough, I had a problem finding 20-bean soups, but 21, sure thing). Of course, when I read the ingredients there, I am at loss to find exactly which 21 kinds of beans went into the mix. I am not really certain how one is able to distinguish between the different beans in such a mixture. How much of a difference can there be between a 13 bean and 15 bean soup? The more beans there are, they more similar they will be, right? What this really says, though, is that each bean type is interchangeable with any other in such a soup. An attitude, I fear, that disrespects the true potential of the ingredients. After all, the amount of cooking a dried black bean that will bring it to tender palatibility will convert a lentil into mush. The proper thing to do, of course, is to cook each type separately before mixing to get a true melange of flavors and textures - but who is going to have seven pots of beans cooking to track them all? Pictured is my version - a four bean stew...except all four are the same bean. Just in four different forms. I used green edamame, silken tofu, fermented soy paste, and soy sauce to make this spicy stew with mushrooms and Sichuan peppercorns. 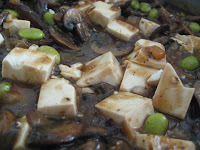 Essentially, I did a ma-po tofu recipe, substituting mushrooms for the meat, and bolstering with edamame.